The Great Lakes Division is a component of the U.S. Naval Sea Cadet Corps, a non-profit youth organization for young Americans, male and female, ages 13 through 17. Based in Mount Clemens, Michigan, we offer hands-on deck and engineering experience as crew members of the training ship Pride of Michigan. The Sea Cadet Corps is sponsored by the U.S. Navy League, and supported by the Department of the Navy and the U.S. Coast Guard. Cadets receive training aboard Navy and Coast Guard ships and schools, and are authorized by the Secretary of the Navy to wear Navy uniforms, appropriately marked with Sea Cadet Corps insignia. In addition to seamanship training, cadets can also attend Navy aviation and construction training. 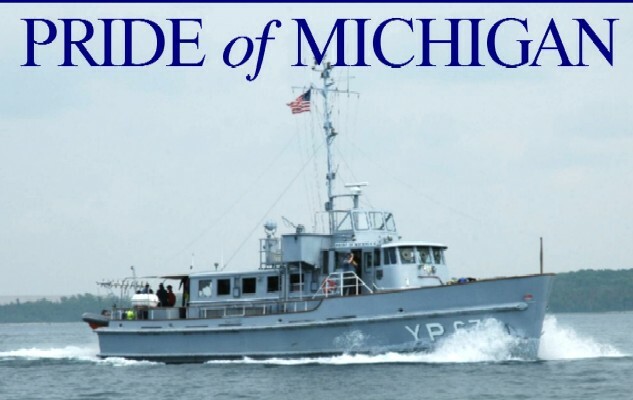 At this website you can board our training ship "Pride of Michigan" to learn about our adventures under way, get information on upcoming training and events in the "Plan of the Day," and link to other websites of interest in the "Chain Locker." If you live in southeastern Michigan, are between 13 and 17 years old, and are interested in adventure, why not join us? For information on joining the Great Lakes Division, U.S. Naval Sea Cadet Corps. Moving from Michigan to Rhode Island is a big step, but that is what Tim and Jenn will be doing this coming May. They visited the state back in August and they simply loved the beaches and ocean. Tim being an avid fisherman, found the abundance of fish especially welcoming. http://resources.seacadets.org is the source for uniform information, regulations, parent information and all other things Naval Sea Cadet.